You could spend a lifetime exploring the many islands of Greece, and yet, a couple of these isles have stolen most of the attention in the eyes of travelers. Mykonos and Santorini are downright stunning, but other islands (in areas beyond the Cyclades) can compete with equally incredible beauty and food, along with much smaller crowds. When planning a recent trip to Greece, I had a few things in mind. I wanted an affordable, less crowded place where I would hear Greek spoken all around me (a rarity in touristy destinations like Santorini). I pictured isolated stretches of quiet beaches and fishing villages along the water with shady tables serving fresh cuisine. I wanted to skip the glitz and get off the grid...so I went to Ithaca. Located west of the Peloponnese in the Ionian Islands, this 46-square mile island is best known for being the home of Odysseus, and the place he was trying to return to in Homer’s The Odyssey. Beyond the classical Greek connection, there are many reasons to climb aboard a ferry, enjoy every quiet minute of the journey, and unwind over two-euro glasses of local white wine. This island is far – both in terms of distance and sensibility – from the Greek islands you may be used to. How to Get There: From Athens, there are several options to reach Ithaca. 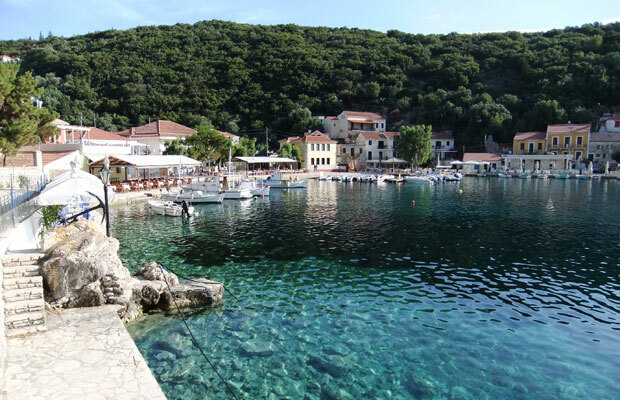 The fastest is to fly to Kefalonia (Olympic Airlines offers flights on small planes) and connect via a short ferry ride to neighboring Ithaca. For the full, slow arrival experience, a journey on the Greek ferry system will prove memorable; connect to the port of Patras from Athens, then board the ferry for a leisurely cruise to Ithaca. Here are a few places to go and things to do on the island of Ithaca. In the port of Vathy, the capital and largest town on the island, Hotel Familia is set away from the waterfront. This seven-room stone building, with its blooming flowerbeds and breakfast served in the garden, is the ideal base from which to explore the island. It's a short stroll to all the restaurants and seafront watering holes in Vathy, yet removed enough to guarantee peace and quiet. Chic rooms are filled with sunlight and original architectural features like sand-colored stone walls and a pitched roof. One benefit to arriving in Ithaca with a rental car (you can bring it on the ferry) is the ability to explore this hilly island at your leisure. A bicycle (available for free at Hotel Familia) can only get you so far, unless you want to break a serious sweat going up the hills (though the sea is always nearby for a quick dip to cool down). A scenic half-hour drive from the port of Vathy, you'll come across the Kioni fishing village. A cluster of casual restaurants occupies the waterfront terrace; this is a place for conversation, an afternoon glass of wine, and plates of fresh grilled octopus. There are also affordable small boats for rent; cruise along the coastline before dropping anchor and jumping out of the boat for a swim. Fringed by trees providing natural shade, Filiatro Beach is a favorite on the island of Ithaca, especially for travelers staying in Vathy. A five-minute drive from the town center leads you to this relaxed beach, known for warm, shallow water and excellent sunbathing conditions. Beaches across the island are made up of tiny white pebbles, rather than ultra-fine sand, but this detail doesn’t impact your ability to kick back and relax. Filatro might be one of the most popular spots on the island for sunbathing, but the coastline is full of many small stretches of beach where you don’t have to see another soul during an afternoon of swimming and dozing off under the shade.